One or Two Guitars — The patented “zig zag” design creates a completely separate case for each guitar. That means both are protected with our Headlock™ suspension system and strap pin bumpers. 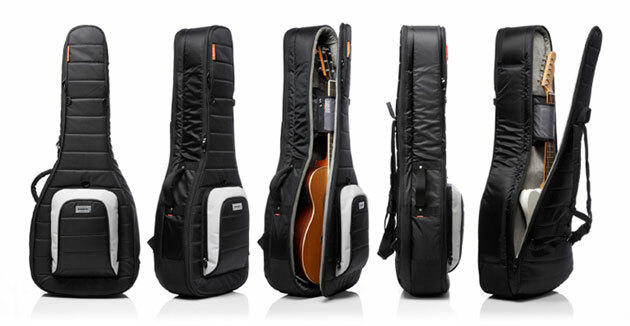 It also means the M80 Dual can be used with 1 or 2 guitars - something you’ll appreciate on the road. Additionally, the Z-form design allows for immediate access to either guitar. Drop-proof — The patented Headlock design provides a level of protection worthy of the finest instruments. Your guitars quickly strap in and remains stabilized during transport. Both headstocks are suspended inside the case, saving your guitars from both side and rear impacts that could otherwise snap the necks. Wear it Out — We build our cases to military specs, using only high-test materials with extreme resistance to abrasion and the elements. Inside, the plush lining protects delicate custom finishes. So your guitar rides first class while you launch an urban assault. The MONO Lifetime Warranty — All MONO products are guaranteed for life against defects in materials and workmanship.